Dible then programs those different nutrient mixes and locations onto the crop sprayer aircraft. As the crop sprayer flies over the field, it dynamically changes the mix of fertilizer based on its location. The $900,000 Air Tractor model 802 has 1300hp and a payload of 9,249 lbs. In 2013 the plane can change its fertilizer mix every dozen meters. Dible, as an engineer, knows what is coming. “One day we will monitor and grow the corn on a stalk-by-stalk basis. When we plant crops, GPS with RTK (Real Time Kinematics) gives us 1-inch accuracy.” It’s not hard to see Dible’s vision even now. 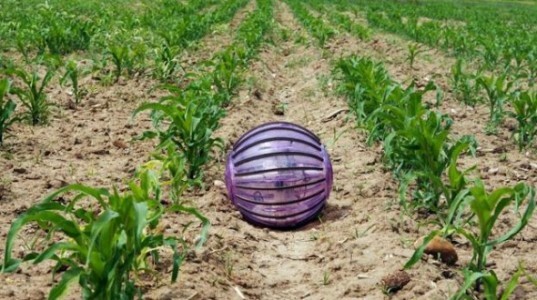 With today’s technology, a small autonomous robot could drive down the rows of corn. A team from the Robotics and Cybernetics Research Group (Technical University of Madrid) has built an experimental farm robot they dubbed the Rosphere. Sensors on the robot could monitor each and every stalk of corn. Those robots can communicate with each other over a mesh network. A mesh network is like a chat room for gadgets. They identify themselves and their capabilities, and are then a shared resource. The enabling technology is when we put all these mesh networks on the internet. This is the so-called internet of things. If the robots that evaluate your individual stalks of corn have a port to the internet, you get a cascading set of benefits. The server computer on a farm can store and manipulate the corn stalk information. But it can also analyze those crop yields. And it might contact Monsanto’s computers to get the best price and delivery on fertilizers, seeds, and pesticides. The farm’s server computer can contact and do automated negotiation with several silos in the area, to insure you get the best price for the crop. The tractor Bob uses on the farm has GPS as well. The tractor on the Dible farm, similar to this one, represents a capital investment of almost one million dollars. 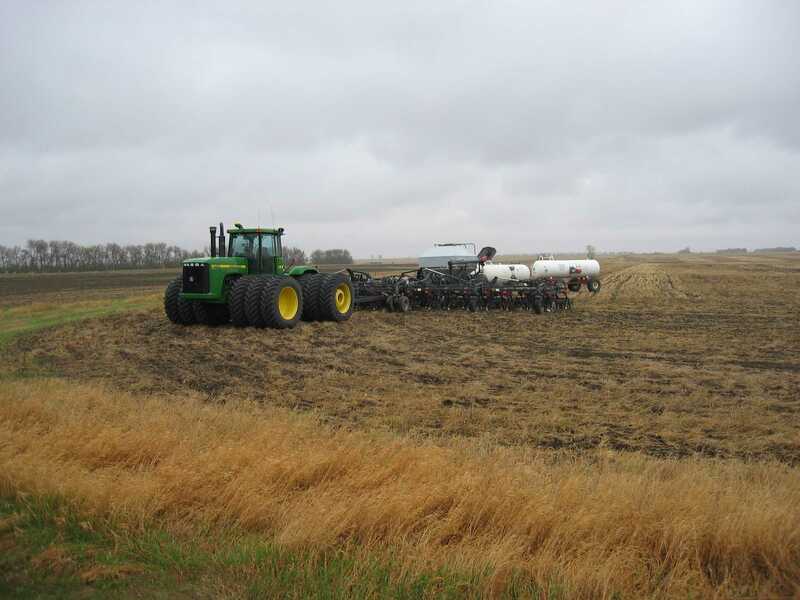 One day ground sprayers will share information with the farm’s server. And that server can go on the internet to order parts, or schedule maintenance on the mechanic’s smart phone while re-scheduling the driver’s time. Already the nearby dairy farm’s newest tractors and loaders “talk” to the John Deere and Caterpillar dealers. “The dealers know where the machinery is, how it is running, and when it needs service,” said Dible. Perhaps your mesh network of corn examination robots finds a particularly virulent pest or fungus. They could go on the internet and notify all the farms around yours, as well as the United States Department of Agriculture. If you’re a cattle rancher, you can use RFID (radio frequency identification) tags on each cow. Foreign countries might embargo your beef if any cases of mad cow disease strike anywhere else in your country. But with individual identification of the cattle, you can prove their provenance, and if your tracking systems are linked to the Internet, your sales to foreign markets will continue unimpeded. 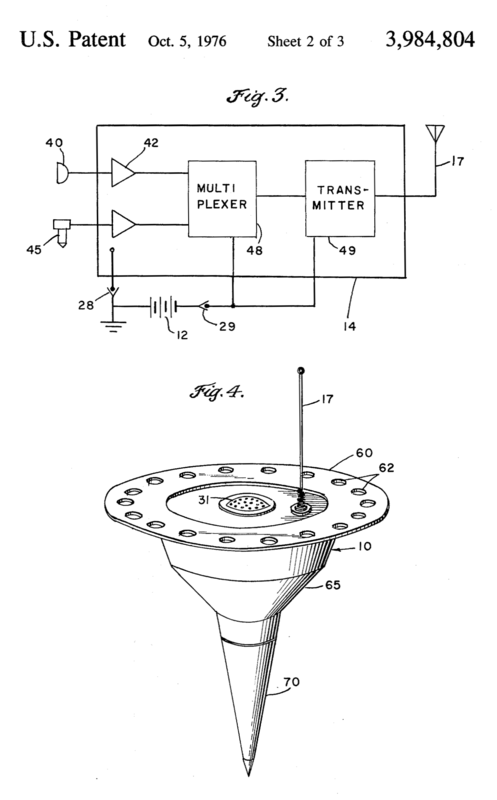 A patent filed in 1971 and granted in 1976 put vibration sensors into radio darts that could be dropped from aircraft. There are antecedents for the mesh network and the internet of things. In the 1970’s the American military was bedeviled by North Vietnam soldiers using the Ho-Chi-Minh trail to bring supplies south to support the war effort. So the Navy invented small darts that had seismometers inside. These darts could detect footsteps and vehicle traffic. They communicated over a radio network. They formed a mesh, and although they did not connect to the yet-to-be-invented internet, they did report to an overarching communications network. Industrial sprinklers for farms are already connected. Each sprinkler head has its own microcontroller. They are a glimpse into what will become available for consumers. UgMO makes a sprinkler system that is suited to golf courses and expensive homes. It has a network of moisture sensors that communicate over RF links to monitor and adjust water usage. This wireless sensor network can reduce you water usage 50 percent. You can see how the next step is to connect this system to the internet so home owners can get the same benefits as farmers and commercial installations. 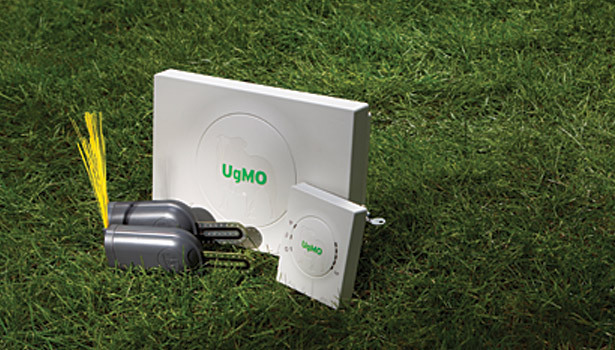 The UgMO sprinker system measures ground moisture and adapts the water usage. Between seed technology, special fungicides, herbicides, pesticides, new methods, and improved control, farming is changing as fast as any other high-tech endeavor. But it is also like working on an engineering program – lots of long hours, and attention to details. “The thing about being an engineer is that you spend your time solving other people’s problems. Now I have to solve my own problems,” quips Dible. If Dible’s farm can monitor and care for each stalk of corn, it’s not hard to see that soon our homes and cars will monitor and care for each of their occupants. The internet of things is ready to let us make another great stride in human progress. So farmers are now renting seeds from Monsanto that depend on pesticides, and soon they will be renting data and cloud services to operate the seed/fertilizer/pesticide dispensary. More organic, please. iMinds (www.iminds.be) is gaining insights in the use (why and how) of Internet of Things applications. Do you want to help us and be involved in the creation of an open IoT platform that allows you to use â€˜smart productsâ€™ and build Smart Living Solutions? If you never spent hours fascinated by Google’s incredible, free, Google Earth app, you’re missing out on an important wake-up call. Once you begin exploring the far corners of the Earth down to the street level with this brilliant, sophisticated, beautiful app, I can’t think of a single person (including yours truly) who can resist typing in their private address to see how they appear via satellite. The results are shocking. It’s very sobering to realize how effortlessly Google gathers and stores satellite photos of your exact location, down to the clothing hanging on the laundry line – without a word. edged sword which can be deadly if placed in the wrong hands. And when the NSA and GCHQ plug in to the internet of things? The internet of things will have to have a fail safe guard against intrusion….any, unwanted intrusion. I’m more worried about the People’s Republic of China’s spy devices – they are shipping them now, in teapots. Or have you forgotten that America and Britain don’t MAKE anything anymore?